I became very interested in Liane Moriarty once I picked up The Husband’s Secret earlier this year. When I heard the concept of The Last Anniversary, I knew that I had to read it and try to solve the decades-old mystery contained within. One day, teens Connie and Rose go to visit their neighbors, Alice and Jack Monroe and their baby, Enigma. The girls, used to their secluded Scribbly Bark Island have no idea where the young married couple are, as when they appear, there is a cooling marble cake and the Monroe’s baby—and no Monroe couple. The story ignites an Australian news phenomenon, as people start to trek to the island from the mainland, trying to get more information and take tours of the site of the disappearance. On the mainland, years later, a woman named Sophie lives her life as normally as possible—she’s 39 and while a successful HR director, she years for something else—almost like a different sort of life. And then she receives contact from her old boyfriend, the man whose proposal she turned down, he is the grandson of Enigma, and his ‘Aunt’ Connie has left her home on Scribbly Bark Island to Sophie—which starts a huge issue among the family. But, is this change good for Sophie? Will Connie’s cryptic message that she will find the perfect man for her via Connie’s letter propel Sophie to go to the Island? 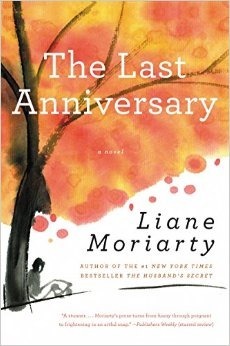 I really enjoyed Liane Moriarty’s writing, and the mystery she creates within the novel. While I was hoping for a different outcome, it was really exciting to read what Moriarty had in store for the Monroes. There is something hardwired in some human brains to be interested in unsolved mysteries—and the concept of the Scribbly Bark Island Monroe mystery is perfect for that type of mind. Sophie is a fantastic character. I felt so sympathetic to her, and I found myself thinking in a way very similar to her throughout the novel—there was only one time where I almost yelled out ‘What are you doing?! ?’ to Sophie as she went through the story. Veronika really grows throughout the novel. First, I felt her character was just the foil for EVERYONE in the novel. However, once I realized why she was unhappy, everything clicked. It may seem a little fast, but it worked out for the best. It was also really interesting to see the way everyone in the larger family reacted to her—or rather did NOT react to her. Overall, I think this was a good book for anyone interested in a beach read or a mystery—it was a well-written novel with some really great characters who are just as subject to failure as we all are—and also just as subject to triumphs. Have you read The Last Anniversary? What did you think? What is your favorite unsolved mystery—please share below!